I attended a "Crafting Day" this afternoon at a friend's house. It ended up being just she and me, which was actually great! She had several projects going, we did some string art and then she bleach dyed a couple of shirts and a skirt. It looked so easy, I decided to try it myself. 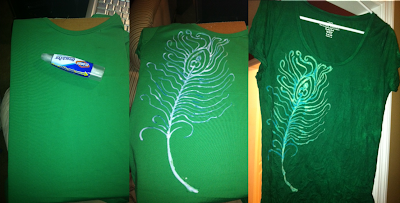 On my way home I picked up the necessary items (plain green shirt $5, bleach pen $3). I googled "How long do I leave bleach on a shirt" and chose this page for my answer. I've seen this kind of thing on Pinterest before, but I free-handed the feather while looking at a drawing of a peacock feather. Center Pic: while bleach was setting - about 10 minutes. Right Pic: after a rinse in hydrogen peroxide and water (1/10).